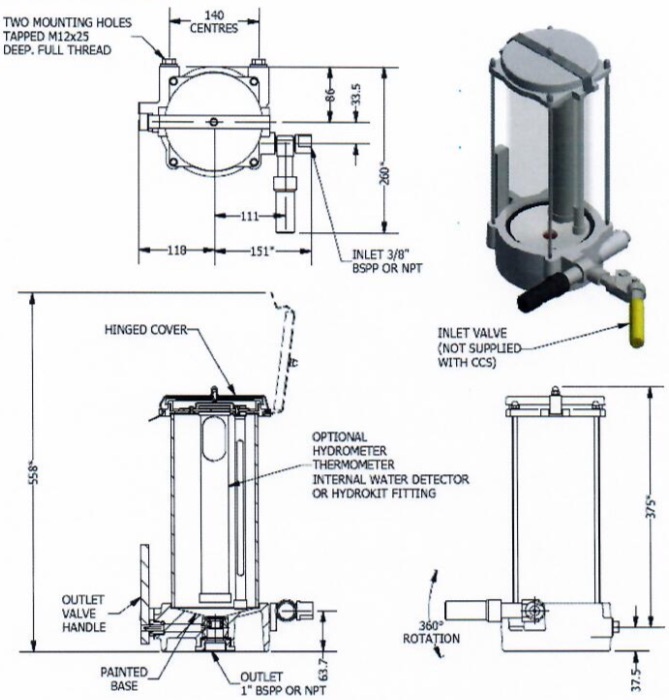 4 Litre Closed Circuit Aviation Fuel Sampler 'CCS' - Welcome to Oilybits U.K. The accepted method of checking the cleanliness of aviation fuel is the 'clear and bright' test, where fuel is swirled around in an open bucket or clear glass jar and visually inspected. However this procedure carries the risk of sample contamination from the elements or from dirty sample points. There is also a high probability of fuel spillage and contact with operations staff, which is unacceptable. The Closed circuit Sampler 'CCS' has been developed to overcome these problems and actually improives sampling procedures, and as a result it is now in widespread use with refueling companies all over the world. The CCS consists of a clear glass tube fitted with a white epoxy coated conical base to assist in the detection of dirt and water, and with a hinged vented cover. The base incorporates a tangential inlet port to promote vortexing of the incoming fuel, and a close couples stainless steel drain valve. 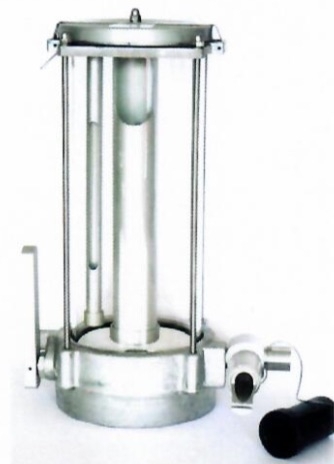 The inlet port should be connected to the sample points using small bore tubing (typically 10mm diameter), and we recommend fitting spring close inlet valves close to the CCS to control the filling operation, which we can also supply. The drain port should be connected into the hydrant dispenser dump tank, depot product recovery system, or storage tank using 20mm inside diameter pipework. It is recommended that the CCS is located such that gravity drainage is possible. If not, we are able to supply a rotary pump and non return valve to drain the CCS. When fuel is drawn into the CCS under pressure from the sample points the tangential inlet port promotes vortexing of the incoming fuel. This concentrates and contamination in the center of the base making detection very easy. After the fuel has been visually inspected the drain valve is opened to release the sample. Internal cleaning of the CCS is accomplished through the hinged lid. A number of options are also available. Hydrometer and Thermometer pockets for density and temperature checks can be provided in conjunction with removeable inner lid. It is also possible to carry out the Shell Water Detector or Exxon Hydrokit test on the fuel sample using an option which can either be fitted to the inner lid (internal) or to a self sealing valve in the inlet port (external). The CCS is available with BSPP or NPT threads.